Definition at line 260 of file titypes.h. Definition at line 268 of file titypes.h. Referenced by DispCancelListenRequest(), DispTdiAssociateAddress(), DispTdiListen(), DispTdiQueryInformation(), TCPConnect(), TCPFinEventHandler(), and TCPListen(). Definition at line 267 of file titypes.h. Definition at line 287 of file titypes.h. Definition at line 271 of file titypes.h. Referenced by FlushConnectQueue(), LogActiveObjects(), TCPAllocateConnectionEndpoint(), TCPConnect(), TCPConnectEventHandler(), and TCPRemoveIRP(). Definition at line 281 of file titypes.h. Referenced by TCPAllocateConnectionEndpoint(), and TCPDisconnect(). Definition at line 280 of file titypes.h. Referenced by DispCancelRequest(), TCPAllocateConnectionEndpoint(), TCPDisconnect(), and TCPSendEventHandler(). Definition at line 264 of file titypes.h. Definition at line 272 of file titypes.h. Referenced by FlushListenQueue(), LogActiveObjects(), TCPAbortListenForSocket(), TCPAccept(), TCPAcceptEventHandler(), TCPAllocateConnectionEndpoint(), and TCPRemoveIRP(). Definition at line 262 of file titypes.h. Referenced by ConnectionFree(), and TCPAllocateConnectionEndpoint(). Definition at line 265 of file titypes.h. Referenced by FlushConnectQueue(), FlushListenQueue(), FlushReceiveQueue(), FlushSendQueue(), FlushShutdownQueue(), LibTCPEnqueuePacket(), TCPAcceptEventHandler(), TCPAllocateConnectionEndpoint(), TCPConnectEventHandler(), TCPReceiveData(), TCPRecvEventHandler(), and TCPSendEventHandler(). Definition at line 289 of file titypes.h. Referenced by DispTdiAssociateAddress(), LogActiveObjects(), and TCPFinEventHandler(). Definition at line 266 of file titypes.h. Definition at line 277 of file titypes.h. Referenced by LibTCPDequeuePacket(), LibTCPEmptyQueue(), LibTCPEnqueuePacket(), LibTCPGetDataFromConnectionQueue(), LogActiveObjects(), and TCPAllocateConnectionEndpoint(). Definition at line 273 of file titypes.h. Referenced by FlushReceiveQueue(), LogActiveObjects(), TCPAllocateConnectionEndpoint(), TCPReceiveData(), TCPRecvEventHandler(), and TCPRemoveIRP(). Definition at line 285 of file titypes.h. Referenced by InternalErrorEventHandler(), InternalRecvEventHandler(), LibTCPGetDataFromConnectionQueue(), and LogActiveObjects(). Definition at line 286 of file titypes.h. Definition at line 263 of file titypes.h. 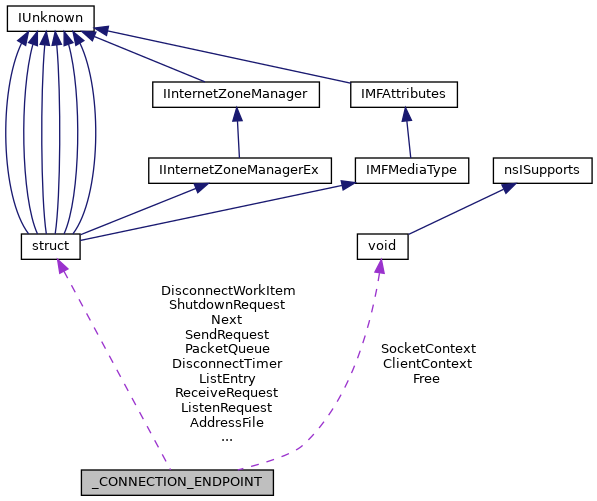 Referenced by LogActiveObjects(), and TCPAllocateConnectionEndpoint(). Definition at line 274 of file titypes.h. Referenced by DisconnectTimeoutDpc(), FlushSendQueue(), LogActiveObjects(), TCPAllocateConnectionEndpoint(), TCPDisconnect(), TCPRemoveIRP(), TCPSendData(), and TCPSendEventHandler(). Definition at line 284 of file titypes.h. Referenced by InternalRecvEventHandler(), and LogActiveObjects(). Definition at line 275 of file titypes.h. Referenced by DisconnectTimeoutDpc(), FlushShutdownQueue(), LogActiveObjects(), TCPAllocateConnectionEndpoint(), TCPDisconnect(), and TCPRemoveIRP(). Definition at line 261 of file titypes.h. Referenced by InternalErrorEventHandler(), InternalRecvEventHandler(), LogActiveObjects(), TCPAcceptEventHandler(), TCPDisconnect(), TCPFinEventHandler(), TCPGetSockAddress(), TCPGetSocketStatus(), TCPListen(), TCPReceiveData(), TCPSendData(), TCPSendEventHandler(), TCPSetNoDelay(), and TCPSocket(). Definition at line 32 of file tcptest.cpp.